Heat a pan and dry roast sesame seeds, stirring continuously on very low flame. At times remove the pan from flame to lower the temperature. Roast till there is no rawness in the seeds and they are golden brown in color. Taste the seeds to check for rawness. When fully roasted remove the seeds and spread them in a plate to cool. Take the red chilies and break them into small pieces. Heat a pan and dry roast cumin seeds. When the cumin seeds are roasted they emanate a nice aroma. Then add the red chili pieces and fry for one more minute till they become crisp. Take a mixie jar and add roasted cumin and red chilies to it. Add the required salt to the mixie jar and grind the ingredients to a fine powder. Now add the roasted sesame seeds and grind for few seconds. If you grind the sesame seeds for more time oil oozes out and the powder becomes lumpy & tastes oily. So crush the sesame seeds in the mixer grinder using PULSE button. Remove the ground powder into a plate and grind the remaining sesame seeds in the similar manner. Now mix the powder well with fingers and store in an airtight bottle. Roasting sesame seeds is the main task in this recipe. At times while roasting, the pan gets heated up fast and the seeds turn brown without getting fried well from inside. So take the pan out of the flame and keep stirring to roast them evenly. Take care while grinding the sesame seeds. Grinding the seeds for long will release oil and makes the powder lumpy. So use PULSE button in the mixer grinder and crush the sesame seeds. While doing this you may find SOME seeds whole—do not bother—as the seeds are roasted they taste better even whole. The given quantity will make one cup of Nuvvu podi. It is better to make small quantities to enjoy the freshness of this powder. It is optional to use cumin seeds. But the roasted cumin gives an extra flavor to this powder. Serve this Nuvvupodi with hot rice and ghee. It can also be served with Idli, Dosa, Utappam Minapattu etc.. Sesame seeds bring warmth (VEDI) to the body. So this Nuvvupodi is better enjoyed in winters. Today i made Nuvvu podi as per your method. Adding jeera gave really a different and nice taste to the podi. Normally we will prepare without adding jeera. 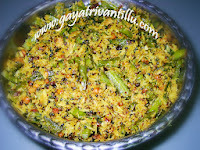 hi, sesame podi looks good..! can we dry roast in microwave?will it dry roast evenly like gas stove? thanks for sharing..
please send pongal receipe (not sweet) khara. i like your recipes and the text explanation with notes and tips are very useful. thank you for sharing the recipes. can't wait to try traditonal andhra vantalu. My husband loves this. I will try it soon. Thanks﻿ for uploading.